This week, three different Buildbox games were featured by Apple in over 60 different countries, including Australia, United Kingdom, Italy, and New Zealand. Although these Buildbox made games differ in terms of gameplay and art style, they have managed to do phenomenally well in the charts. Fabmika Games’ Slip Away was published by Nanovation and features a visually stunning art style. In Slip Away players are transported to the dark depths of the ocean on a mission to lead an octopus out of the abyss. Bubbles, spikes, lasers, bombs, and moving platforms are just a handful of the obstacles that players will encounter. To escape the ocean trenches players must strategically avoid the moving obstacles. There’s also scattered gems that can be collected to unlock different octopus characters. The game features 19 colorful unlockable characters in all. Slip Away was also ranked in the Top 100 charts in Canada, Russia, France, and Germany. Developed by Essendon Studios and published by Umbrella Games, Risky Rooms, is a challenging action arcade game with a simplistic art style. In Risky Rooms players must guide their character across a room scattered with dangerous obstacles and traps. As the game progresses the traps become deadlier and increasingly challenging to clear. There are 50 insane levels to complete in total. One of the standout features in Risky Rooms is the cool way the light and trail effects was used in the game to give the simple shapes not only movement, but a mysterious ominous vibe as well. Risky Rooms is also ranked in the Top 100 charts in Canada, Hong Kong, and India. Risky Rooms is available now on iOS. Buildbox customer, Luca Petrucci, created an extremely addicting game called Springy Ball. 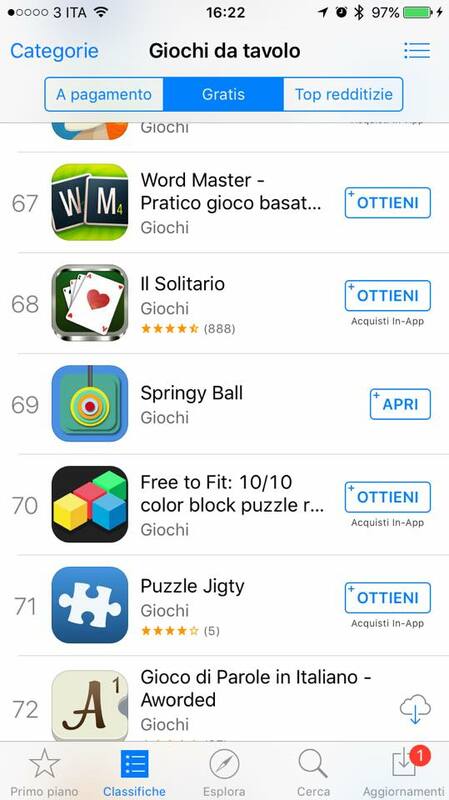 Springy Ball was featured in Luca’s home country of Italy, and is holding down the #69 spot in the top charts. Springy Ball is currently available for download on iOS. It’s always great to see our customers succeed. Big congrats to both teams at Fabmika Games and Essendon Studios on their international success! Risky Rooms also makes it to the “Games We Love” of the US AppStore under Action & Arcade category.